Technical Writing Certification provides a way to verify to employers that you have a solid understanding of certain technical writing concepts and skills. Having a certification can look good on a resume, particularly if you are just getting into technical writing or you are returning to the field after a long absence. When looking and applying for jobs you should always check the employer's requirements. The main criteria you will be judged on is your prior experience and your familiarity with different types of software and writing. If you have no prior job experience in technical writing then any prior experience with writing, programming or computers may be helpful, especially if you are applying for an entry level position. Having completed a technical writing certification could give you an edge against an applicant with an otherwise similar resume. Certification is probably not necessary for technical writers with a long history and a mastery of skills accumulated from work experience. The Society for Technical Communication (STC) says professional certification can help an employee validate their skills and knowledge. They also say it provides "differentiation from others in the hiring process and the ability to command higher pay." The STC recently started a professional certification program for technical communicators. It is a three-tiered professional certification program. The three tiers include Foundation, Practitioner and Expert. The Foundation Certification is currently available (through a test). The STC says the higher level certification will open later this year and in 2019. The STC offers certification through a test it developed. You can take the take the test from AMPG International. The exam is called the Certified Professional Technical Communicator (CPTC) exam. The CPTC exam for Foundation Certification approaches technical communication from these 9 key areas: "Project Planning, Project Analysis, Content Development, Organizational Design, Written Communication, Visual Communication, Reviewing and Editing, Content Management and Production Delivery." The CPTC test costs $245 for STC members and $495 for nonmembers. It is offered through public and online exam sessions. The STC says "once an applicant passes the test, he/she will be issued a certificate and entered into the STC certification database." The name of technical writers with current certifications will appear on the STC and APMG websites under a list of current, certified practitioners. You can find a list of current certified technical communicators here. The STC says a technical communicator has to stay current with continuing education requirements to keep their certification in good standing. You can self-study for the exam. 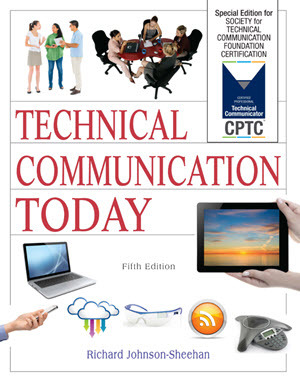 The STC says the book uses the Richard Johnson-Sheehan’s Technical Communication Today, Fifth Edition for the 50 question exam. The STC also has a CPTC study guide online as a PDF file. A small list of trainers for the CPTC courses can be found on the STC's accredited trainers page. Technical writing certification courses are also offered at a growing number at colleges and universities. Most of these types of courses are fairly new. There are a growing number of them available online and they offer their own certificates. Unless they also offer the CPTC test you would have to come back and take the take the CPTC test if you wanted both the college certificate and the CPTC certification. We examined course offerings from major universities for technical writing certificate programs. We found programs averaging from $1,000 to $3,000 depending on the school and the hours of study involved. A search for technical writing certification course will bring up many results.